As you know, in addition to reading, many of us enjoy listening to podcasts and here are two that I would like to recommend. First of all “Gonads” by Radiolab is an excellent series about human biology and identity. Radiolab always seems to make first class, professionally edited podcasts. Check out the full list of their offerings online. 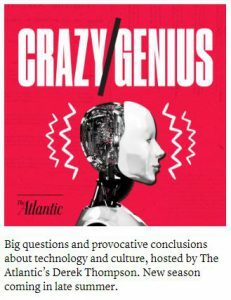 Another great science (and more) podcast is Crazy/Genius which is produced by The Atlantic. Each program addresses a very current question in technology or culture. Some of my favorites were: Should We Dim the Skies to Save the World? and Should We Break Up Amazon? Excellent 20 minute discussions with experts reveal both sides of the issues.